Islamophobia (or anti-Muslim sentiment) is a term for prejudice against, hatred towards, or fear of the religion of Islam or Muslims. The term entered into common English usage in 1997 with the publication of a report by the Runnymede Trust condemning negative emotions such as fear, hatred, and dread directed at Islam or Muslims. While the term is now widely used, both the term itself and the underlying concept have been criticized. According to the Oxford English Dictionary, the word means "Intense dislike or fear of Islam, esp. as a political force; hostility or prejudice towards Muslims" and is attested in English as early as 1923. Mattias Gardell defines Islamophobia as "socially reproduced prejudices and aversion to Islam and Muslims, as well as actions and practices that attack, exclude or discriminate against persons on the basis that they are or perceived to be Muslim and be associated with Islam". The Berkeley University Islamophobia Research & Documentation Project suggested the working definition: "Islamophobia is a contrived fear or prejudice fomented by the existing Eurocentric and Orientalist global power structure. It is directed at a perceived or real Muslim threat through the maintenance and extension of existing disparities in economic, political, social and cultural relations, while rationalizing the necessity to deploy violence as a tool to achieve 'civilizational rehab' of the target communities (Muslim or otherwise). Islamophobia reintroduces and reaffirms a global racial structure through which resource distribution disparities are maintained and extended." The exact definition of Islamophobia continues to be discussed with academics such as Chris Allen saying that it lacks a clear definition. Johannes Kandel, in a 2006 comment wrote that Islamophobia "is a vague term which encompasses every conceivable actual and imagined act of hostility against Muslims", and proceeds to argue that five of the criteria put forward by The Runnymede trust are invalid. In an article published in the June 2013 edition of Standpoint, Douglas Murray argued that "the term 'Islamophobia' is so inexact that - in so far as there is a definition - it includes insult of and even inquiry into any aspect of Islam, including Muslim scripture." When discrimination towards Muslims placed an emphasis on their religious affiliation and adherence, it has been termed as Muslimphobia, its alternative form of Muslimophobia, Islamophobism, antimuslimness and antimuslimism. Individuals who discriminate against Muslims in general have been termed Islamophobes, Islamophobists, anti-Muslimists, antimuslimists, islamophobiacs, anti-Muhammadan, Muslimphobes or its alternative spelling of Muslimophobes, while individuals motivated by a specific anti-Muslim agenda or bigotry have been described as being anti-mosque, anti-Shiites. (or Shiaphobes), anti-Sufism (or Sufi-phobia) and anti-Sunni (or Sunniphobes). As opposed to being a psychological or individualistic phobia, according to professors of religion Peter Gottschalk and Gabriel Greenberg, "Islamophobia" connotes a social anxiety about Islam and Muslims. Some social scientists have adopted this definition and developed instruments to measure Islamophobia in form of fearful attitudes towards, and avoidance of, Muslims and Islam, arguing that Islamophobia should "essentially be understood as an affective part of social stigma towards Islam and Muslims, namely fear" (p. 2). Several scholars consider Islamophobia to be a form of racism. A 2007 article in Journal of Sociology defines Islamophobia as anti-Muslim racism and a continuation of anti-Asian and anti-Arab racism. Similarly, John Denham has drawn parallels between modern Islamophobia and the antisemitism of the 1930s, so have Maud Olofsson, and Jan Hjärpe, among others. 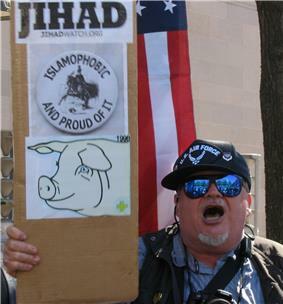 An American protester holding a sign saying he's Islamophobic. Abbas, Tahir (2005). Muslim Britain: Communities Under Pressure. Zed. van Driel, B. (2004). Confronting Islamophobia In Educational Practice. Trentham Books. Gottschalk, P.; Greenberg, G. (2007). Islamophobia: Making Muslims the Enemy. Lanham: Rowman & Littlefield publishers. Greaves, R. (2004). Islam and the West Post 9/11. Ashgate publishing Ltd.
Quraishi, M. (2005). Muslims and Crime: A Comparative Study. Ashgate Publishing. Ramadan, T. (2004). Western Muslims and the Future of Islam. Oxford: Oxford University Press. Richardson, John E. (2004). (Mis)representing Islam: the racism and rhetoric of British broadsheet newspapers. Poole, E. (2003). "Islamophobia". In Cashmore, Ellis. Encyclopedia of Race and Ethnic Studies. Routledge. pp. 215–219. Benn, T.; Jawad, H. (2004). Muslim Women in the United Kingdom and Beyond: Experiences and Images. Egorova, Y.; Parfitt, T. (2003). Jews, Muslims, and Mass Media: Mediating the 'Other'. London: Routledge Curzon. Haddad, Y. (2002). Muslims in the West: From Sojourners to Citizens. Oxford: Oxford University Press. Johnson, M. R. D.; Soydan, H; Williams, C. (1998). Social Work and Minorities: European Perspectives. London; New York: Routledge. R Miles and M Brown (2003). Racism. London; New York: Routledge. Imhoff, Roland & Recker, Julia; Recker (December 2012). "Differentiating Islamophobia:Introducing a new scale to measure Islamoprejudice and Secular Islam Critique". Political Psychology 33 (6): 811–824. ^ Corrina Balash Kerr (2007-11-20). "Faculty, Alumnus Discuss Concept of "Islamophobia" in Co-Authored Book". ^ Lee, S. A.; Gibbons, J. A.; Thompson, J. M.; Timani, H. S. (2009). "The islamophobia scale: Instrument development and initial validation". International Journal for the Psychology of Religion 19 (2): 92–105. ^ a b c d e Kunst, J. R.; Sam, D. L.; Ulleberg, P. (2012). "Perceived islamophobia: Scale development and validation". International Journal of Intercultural Relations 37: 225–237. Nathan Lean (2012). The Islamophobia Industry: How the Right Manufactures Fear of Muslims. Pluto Press. ^ Poynting, S.; Mason, V. (2007). "The resistible rise of Islamophobia: Anti-Muslim racism in the UK and Australia before 11 September 2001". Journal of Sociology 43: 61. ^ Anna Triandafyllidou, ed. (2010). Muslims in 21st Century Europe: Structural and Cultural Perspectives. Routledge. p. 28. ^ Andrew Shryock, ed. (2010). Islamophobia/Islamophilia: Beyond the Politics of Enemy and Friend. Indiana University Press. pp. 6–25. ^ Frost, D. (2008). "Islamophobia: Examining causal links between the media and "race hate" from "below"". International Journal of Sociology and Social Policy 28 (11/12): 564–578. ^ a b Alan Johnson (6 Mar 2011). "'"The Idea of 'Islamophobia. World Affairs. ^ Aldridge, Alan (February 1, 2000). Religion in the Contemporary World: A Sociological Introduction. Polity Press. p. 138. ^ Bleich, Erik (2011). "What Is Islamophobia and How Much Is There? Theorizing and Measuring an Emerging Comparative Concept". ^ Dinet, Alphonse Étienne; ben Ibrahim, Sliman (1918). La Vie de Mohammed, Prophète d’Allah. Paris. cited from Otterbeck, Jonas; Bevelander, Pieter (2006). Islamofobi — en studie av begreppet, ungdomars attityder och unga muslimars utsatthet (PDF) (in Swedish). Anders Lange. Stockholm: Forum för levande historia. ^ Bravo López, F. (2011). "Towards a definition of Islamophobia: Approximations of the early twentieth century". Ethnic and Racial Studies 34 (4): 556–573. ^ Otterbeck, Jonas; Bevelander, Pieter (2006). Islamofobi — en studie av begreppet, ungdomars attityder och unga muslimars utsatthet (PDF) (in Swedish). Anders Lange. Stockholm: Forum för levande historia. ^ a b Bhandar, D. (2010). "Cultural politics: Disciplining citizenship". Citizenship Studies 14 (3): 331–343. ^ Fredman, Sandra (2001). Discrimination and human rights: the case of racism. Oxford [Oxfordshire]: Oxford University Press. p. 121. Islamophobia: A Challenge for Us All, Runnymede Trust, 1997, p. 1, cited in Quraishi, Muzammil (2005). Muslims and crime: a comparative study. Aldershot, Hants, England: Ashgate. p. 60. ^ a b Holden, Cathie; Hicks, David V. (2007). Teaching the global dimension: key principles and effective practice. New York: Routledge. p. 140. ^ Mepschen, P.; Duyvendak, J. W.; Tonkens, E. H. (2010). "Sexual Politics, Orientalism and Multicultural Citizenship in the Netherlands". Sociology 44 (5): 962. ^ Ho, Christina (July–August 2007). "Muslim women's new defenders: Women's rights, nationalism and Islamophobia in contemporary Australia". ^ Bunzl, Matti (2007). Anti-semitism and Islamophobia: hatreds old and new in Europe. Chicago: Prickly Paradigm Press. p. 13. ^ Benbassa, Esther (2007). "Xenophobia, Anti-Semitism, and Racism". In Bunzl, Matti. Anti-Semitism and Islamophobia: Hatred Old and New in Europe (PDF). Chicago: Prickly Paradigm Press. p. 86f. ^ Schiffer, S.; Wagner, C. (2011). "Anti-Semitism and Islamophobia - new enemies, old patterns". Race & Class 52 (3): 77. ^ Richardson, John E. (2004). (Mis)representing Islam: the racism and rhetoric of British broadsheet newspapers. ^ Mehdi Hasan (9 July 2009). "Know your enemy". ^ Haroon Siddique (8 Oct 2013). 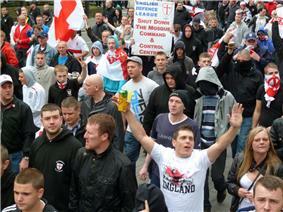 "'"Tommy Robinson quits EDL saying it has become 'too extreme. The Guardian. ^ Kumar, Kumar (2012). Islamophobia and the Politics of Empire. Haymarket Books. p. 6. ^ "Britain divided by Islam, survey finds". ^ The FBI reports anti-Islamic hate crimes directed against persons or property its annual reports indexed here. Data reported here are from the FBI Hate Crime reports of 2013, 2012, 2011, 2010, 2009, 2008, 2007, 2006, 2005, 2004, 2003, 2002, 2001, 2000, 1999, 1998, 1997, and 1996. Totals and averages reported here are derived as calculations from the FBI data. ^ Roald, Anne Sophie (2004). New Muslims in the European Context: The Experience of Scandinavian Converts. Brill. p. 53. ^ "Conference Two: Combating Intolerance". Chancellery of the Government of Sweden. Archived from the original on September 23, 2010. Retrieved 19 November 2011. ^ Poole, E. (2003) p. 218. "The Runnymede Trust has been successful in that the term Islamophobia is now widely recognized and used, though many right-wing commentators reject its existence or argue that it is justified. However, now becoming a catch-all label for any harassment involving Muslims, it should not be considered unproblematic." ^ Haslam, Nick (17 December 2008). "Bigots are just sick at heart". ^ Goldberg, Jeffrey (16 January 2015). "Islamophobia'"French Prime Minister: 'I Refuse to Use This Term . ^ Warren J. Blumenfeld (5 December 2012). "'"The Associated Press and Terms Like'Homophobia. Huffington Post. Retrieved 6 June 2013. ^ Dylan Byers (26 December 2012). "'"AP Nixes 'homophobia', 'ethnic cleansing. Politico. Retrieved 5 June 2013. In 2014 Integrationsverket (the Swedish National Integration Board) defined Islamophobia as "racism and discrimination expressed towards Muslims." The largest project monitoring Islamophobia was undertaken following 9/11 by the EU watchdog, University of Birmingham, was based on 75 reports — 15 from each EU member nation. The report highlighted the regularity with which ordinary Muslims became targets for abusive and sometimes violent retaliatory attacks after 9/11. Despite localized differences within each member nation, the recurrence of attacks on recognizable and visible traits of Islam and Muslims was the report's most significant finding. Incidents consisted of verbal abuse, blaming all Muslims for terrorism, forcibly removing women's hijabs, spitting on Muslims, calling children "Osama", and random assaults. A number of Muslims were hospitalized and in one instance paralyzed. The report also discussed the portrayal of Muslims in the media. Inherent negativity, stereotypical images, fantastical representations, and exaggerated caricatures were all identified. The report concluded that "a greater receptivity towards anti-Muslim and other xenophobic ideas and sentiments has, and may well continue, to become more tolerated." In contrast, the overall numbers of arson and total offenses declined from pre-2001 to post-2001. Specifically, the FBI's annual hate crimes statistics reports from 1996 to 2013 document average numbers of anti-Islamic offenses at 31 per year before 2001, then a leap to 546 in 2001 (the year of 9-11 attacks), and averaging 159 per since. Among those offenses are anti-Islamic arson incidents which have a similar pattern: arson incidents averaged .4 per year pre-2001, jumped to 18 in 2001, and averaged 1.5 annually since. The data show that recorded anti-Islamic hate crimes in the United States jumped dramatically in 2001. Anti-Islamic hate crimes then subsided, but continued at a significantly higher pace than in pre-2001 years. The step up is in contrast to decreases in total hate crimes and to the decline in overall crime in the U.S. since the 1990s. Data on types of hate crimes has been collected by the U.S. FBI since 1992, to carry out the dictates of the 1990 Hate Crime Statistics Act. Hate crime offenses include crimes against persons (such as assaults) and against property (such as arson), and are classified by various race-based, religion-based, and other motivations. In 2005 Rowan Williams and the former Lord Chief Justice, Lord Phillips, that sharia law should be introduced into Britain. The fact is, wrote Malik, that such well-respected public figures as Akhtar, Shadjareh and Yaqoob need "a history lesson about the real Holocaust reveals how warped the Muslim grievance culture has become." Patel, Humphries, and Naik (1998) claim that "Islamophobia has always been present in Western countries and cultures. In the last two decades, it has become accentuated, explicit and extreme." However, Vertovec (2002) states that some have observed that Islamophobia has not necessarily escalated in the past decades, but that there has been increased public scrutiny of it. According to Abduljalil Sajid, one of the members of the Runnymede Trust's Commission on British Muslims and Islamophobia, "Islamophobias" have existed in varying strains throughout history, with each version possessing its own distinct features as well as similarities or adaptations from others. Islamophobia has become a topic of increasing sociological and political importance. 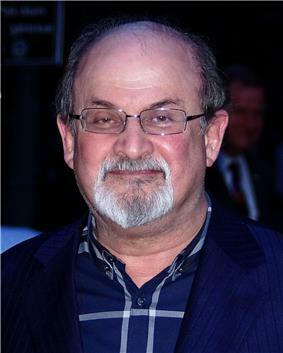 According to Benn and Jawad, Islamophobia has increased since Ayatollah Khomeini's 1989 fatwa inciting Muslims to attempt to murder Salman Rushdie, the author of The Satanic Verses, and since the September 11 attacks (in 2001). Anthropologist Steven Vertovec writes that the purported growth in Islamophobia may be associated with increased Muslim presence in society and successes. He suggests a circular model, where increased hostility towards Islam and Muslims results in governmental countermeasures such as institutional guidelines and changes to legislation, which itself may fuel further Islamophobia due to increased accommodation for Muslims in public life. Vertovec concludes: "As the public sphere shifts to provide a more prominent place for Muslims, Islamophobic tendencies may amplify." The Islamic extremism in the UK. The EDL’s former leader, Tommy Robinson, left the group in 2013 saying it had become too extreme and that street protests were ineffective. Stop Islamization of America (SIOA) and the Freedom Defense Initiative are designated as hate groups by the Anti-Defamation League and the Southern Poverty Law Center. In August 2012 SIOA generated media publicity by sponsoring billboards in New York subway stations claiming there had been 19,250 terrorist attacks by Muslims since 9/11 and stating "it's not Islamophobia, it's Islamorealism." It later ran advertisements reading "In any war between the civilized man and the savage, support the civilized man. Support Israel. Defeat Jihad." Several groups condemned the advertisements as "hate speech" about all Muslims while others defended the ad as a narrow criticism of violent jihad. 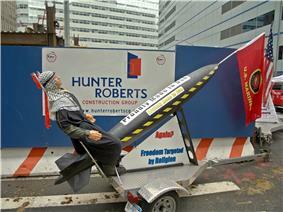 In early January 2013 the Freedom Defense Initiative put up advertisements next to 228 clocks in 39 New York subway stations showing the 2001 attacks on the World Trade Center with a quote attributed to the 151st verse of chapter 3 of the Quran: “Soon shall we cast terror into the hearts of the unbelievers.” The New York City Transit Authority, which said it would have to carry the advertisements on First Amendment grounds, insisted that 25% of the ad contain a Transit Authority disclaimer. These advertisements also were criticized.